Private comfortable home and studio where your backyard is the ocean. Beautiful oceanfront setting where the waves splash against your deck. The beds in the master bedroom of the house and studio are less than 35 feet from the ocean. The main house has a gourmet kitchen, fans, large private covered lanai, sun area, and swimming pool (solar heated) next to the ocean. The studio located on the other side of the garden, approximately 35 feet from the main house also has a gourmet kitchen, fan, private covered lanai, separate entrance & private parking area. It is said we have the best location on the entire stretch of Alii Drive... we're located near the end of Alii Drive overlooking Kahalu'u Bay. The south side of our property is bordered by an ancient Hawaiian temple called the Ku'emanu Heiau that is dedicated to the sport of surfing. Adjacent to the temple is the historical St. Peter's Little Blue Church & Kahalu'u Beach Park, one of the best snorkeling spots on the entire island and only a two minute walk. Both house and studio have spectacular ocean views for sunsets and whale, dolphin, and surfer watching. If you don't need quite so much room, please see our studio VRBO site # 201215. Although close to shops, restaurants, and downtown Kailua-Kona, privacy is well assured. Swimming, snorkeling, diving, boating, fishing, surfing, sailing, kayaking, golfing, hiking, horseback riding, shopping, and volcano watching are just some of the exciting things to do on the Big Island of Hawaii. Come and enjoy . . . LIVE ALOHA! * $300-$500 refundable Security Deposit. * $150 Cleaning Fee for house and/or $95 Cleaning Fee for studio. * Pets are NOT allowed, No Smoking. * Max capacity: 4 persons (house) 2 persons (studio) unless approved prior to arrival with additional cost. 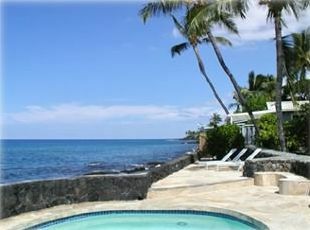 We are the first residence north of Kahala'u Beach Park. Solar heated - temperature dependent on weather. My wife and I had a great week at this rental. It backs right up to the ocean and has incredible sunsets every night. We would definitely rent this home again. Julie is very helpful through the whole rental process and was great to deal with. The only reason this is not 5 stars is that the pool needs a thorough cleaning. We still used the pool every day but it is fairly green at this point and needs to be scrubbed down. All in all you cannot go wrong with this rental. Great view, can't beat sitting on pool deck watching surfers, people snorkeling, and sea breezes! Even better in the evenings with crashing waves and an ice cold Kona! The house was very well equipped from cooking utensils, to beach toys, to bathroom necessities. Julie was VERY accommodating and was readily available to answer our questions. It was nice having a washer and dryer available. It would have been nice to have central air but I understand most homes don't have it. There were ceiling fans, floor fans and a nice breeze but coming from Michigan and 20 degree weather to 70 and 80 degree weather, it was warm by our standards. This was our second stay here, so I guess that says it all. Julie's cozy Hawaiian house has all we need for our family of four. If you add the studio there's room for two more. The interior is very nicely done and clearly more personal with a distinct Hawaiian theme that you do not find in most other condos or houses that are up for rent in Kona. But most of all, the locaction is fantastic. While in Kona, you should make sure to travel around a bit a see all the musts on the Big Island, such as Mauna Kea, the volcano park etc. But if you feel like just relaxing and taking it easy, staying here will allow you to do just that. The only reason to leave the property will be do buy supplies at the nearby KTA. For the rest, you can enjoy Hawaii sunsets, turtles, palm trees, surf and corals right here. Simply perfect. Rental is based on Saturday to Saturday week with a maximum of 4 guests. Other arrival/departure dates may be available if stay is over 1 week and either arrival/departure day is a Saturday. For other exceptions please check in with owner. SPECIAL DISCOUNTS may be available. No pets. No smoking. No large parties or gatherings.